AmeriCorps opportunities for young adults, ages 18-25, include non-residential Field Crews in northern, central and southern Minnesota and central Iowa, which engage young adults in year-round natural resource and emergency response work. Conservation Apprentices serve in Soil and Water Conservation Districts throughout Minnesota where they learn hands-on skills in resource management. Home Energy Squads install energy-saving measures in homes, such as weather-stripping and programmable thermostats. Individual placements serve in nonprofit and government agencies focused on energy, natural resource management and community outreach. AmeriCorps young adults are also Youth Leaders for two programs that engage teens, ages 15 to 18, in outdoor service-learning: Youth Outdoors and Summer Youth Corps. AmeriCorps Field Crew Members and Leaders (ages 18-25) receive on-the-job training to learn natural resources management skills and put those skills into practice completing habitat restoration projects throughout the Midwest. Crews complete natural resource conservation projects such as tree planting, exotic species management, trail construction, stream bank stabilization, prescribed burning, wildland fire fighting and emergency response. Crew Members and Leaders also get the chance to work alongside conservation professionals and explore career options within the environmental field. AmeriCorps Youth Outdoors Members and Leaders perform natural resource restoration projects with a crew of their adult peers and engage Twin Cities youth in after-school service projects and environmental education. 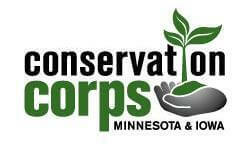 In spring and fall, corpsmembers lead crews of Twin Cities’ youth participants (ages 15-18) in environmental education and community service projects after school and on Saturdays. In summer, crews complete natural resource restoration projects. Corpsmembers inspire youth, conduct community outreach and restore habitat in partnership with resource management agencies, working alongside conservation professionals. Individual Placement members serve in a single-placement setting with various government and nonprofit partners of the Corps. Past partners include the Minnesota Department of Natural Resources, the University of Minnesota Extension, the Monarch Joint Venture Initiative and the YMCA.